As picked by you... and me ~. Have you seen it yet - the PezCycling Youtube channel? I've logged over 225,000 video views, but we're just getting started, and I'd love your help because I think there's some great cycling videos in here. If you haven't already - please take a look and maybe even join the hundreds before you who've already clicked "subscribe"... Let's see if we can't break that 1000 subscribers mark. Who's with me...? 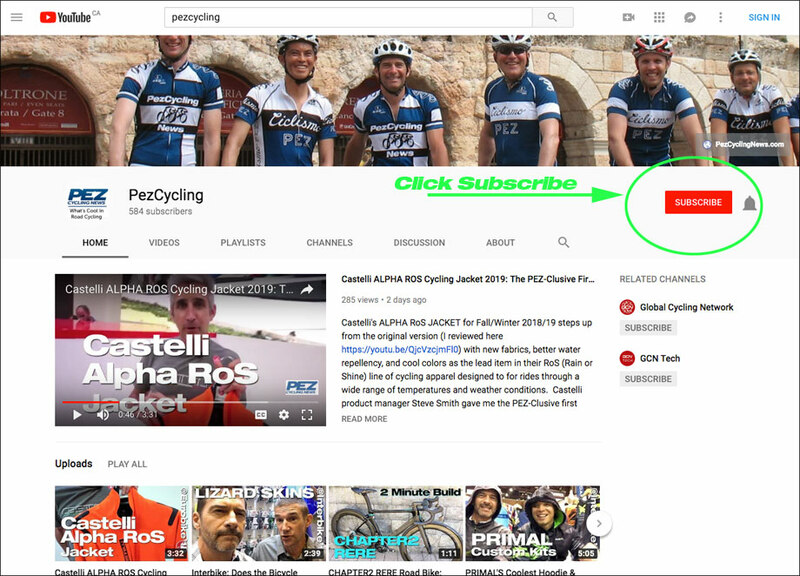 I've been busy adding videos to the plumped up PEZCycling Youtube channel - about 1 new video per week - covering off the same wide variety of fun topics and themes we built this site on. I start with "what's cool in road cycling" and go from there... Not surprisingly, the gear review videos are the most viewed, but there's so many other cool vids to watch - like snippets from some of the Top Rides and other travel destinations, to some unexpected food and drink ideas, interviews, and other stuff that's connected to road cycling, but maybe not in ways you'd at first expect. You may have seen some of the video in our posts here on the main site, or maybe on our Facebook or Instagram pages, but the real action is at the PEZCycling Youtube channel. My ask here, is that you - Dear Readers - click on over to the PEZ Youtube channel and click the subscribe button. Then - also click that Bell button to be notified every time I post a new video - so you won't miss out on whatever piece of riveting entertainment I throw your way. To get you started - I've selected my Editor's Picks - a few of my own favorite videos that I'm happy to suggest as worth watching. Another gear review - yes - but worth watching because this pump is worth knowing about. There are over 100 videos on the channel, and I plan to keep 'em coming, so if you like anything you've seen, please go ahead and join the subscription list - I'm pretty sure you'll be glad you did. Check out the PEZCycling Youtube channel here.